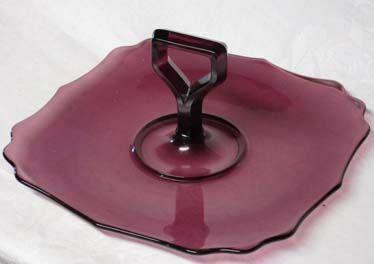 Paden City Amethyst Tort (handled sandwich tray) is 10" square and in excellent condition. Some bottom scratches (near center where it sits) I consider "light". Made before 1950. This Paden City Crow Foot Comport measures about 3.75" high and is 6.5" square. It is in mint condition. Two are available. 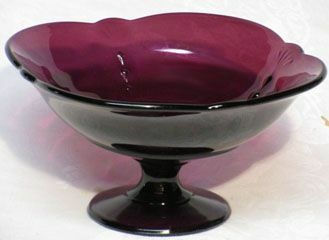 Paden City Penny Line Tort (sandwich tray w/handle) in dark amethyst. In mint condition. Made in the 1930's. Tort measures 10.5" across and has a heart shaped handle. (The pattern of the table cloth behind the Tort is showing significantly, there is no etching on this Tort). 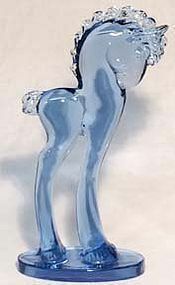 Paden City Blue Pony, 12"
This Paden City blue pony was made in the 1940's. Twelve inches tall and about 6" wide at the base. It is in excellent condition, does have a few scratch marks on the ground/polished bottom (normal usage). Very rare to find this pony in blue. 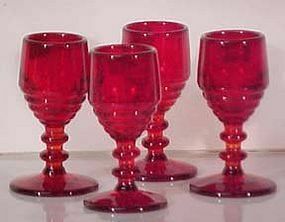 Paden City Penny Line Cordials in ruby. Four are available, all in mint condition. Made in early 1930's.